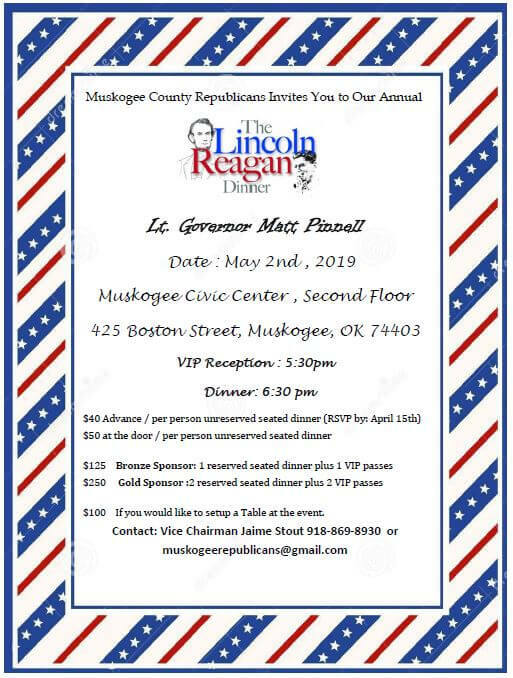 The Muskogee County Republicans Invite you to the Annual Lincoln Reagan Dinner featuring Lt. Governor Matt Pinnell. $40 in Advance (RSVP by April 15) or $50 at the door, per person unreserved seated dinner. $100 if you would like to set up a table at the event. For more information contact Vice Chair, Jaime Stout at 918-869-9-8930 or by email at muskogeerepublicans@gmail.com.